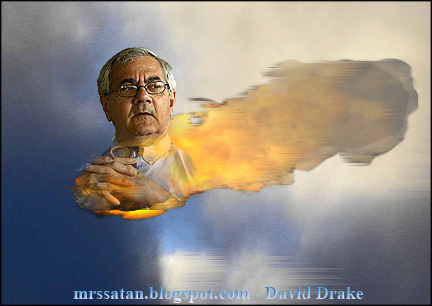 DemocRAT Congressman and patronizer of male prostitutes Barney Frank is a lying, lying, lying sack of liquid crap. He's blaming Republicans for failing to pass Monday's $700 Billion Boondoggle vote. Who in the hell is he trying to kid? Of the 37 Democratic members of the House Financial Services Committee, 25 voted for the bill, 12 voted against it. Of the 33 Republican members of the House Financial Services Committee, only 8 voted for the bill, 25 voted against it. Meaning 76% of the Republicans on the committee where the bill originated voted against it -- a worse percentage than the House GOP as a whole. Who is flaming object spBarney spFrank trying to kid? What a gaseous lying sack of liquid crap he is. [Frank's] fingerprints are all over this fiasco. Time and time again, Frank insisted that Fannie Mae and Freddie Mac were in good shape. Five years ago, for example, when the Bush administration proposed much tighter regulation of the two companies, Frank was adamant that "these two entities, Fannie Mae and Freddie Mac, are not facing any kind of financial crisis." When the White House warned of "systemic risk for our financial system" unless the mortgage giants were curbed, Frank complained that the administration was more concerned about financial safety than about housing. When it comes to the Wall Street meltdown, Rep. Barney Frank is considered the engineer of the financial train wreck, a bostonherald.com instant poll shows. Frank (D-Newton), chairman of the House Financial Services panel, is plastered with blame even more so than President Bush or former fed chief Alan Greenspan. * 36 percent state Frank is out in front. * Bush is second with 29 percent for missing red flags. * Greenspan, now knocked off his guru perch, is third with 19 percent blame. * Former President Bill Clinton falls next with 12 percent responsibility. * Barack Obama, 3 percent, and John McCain, 1 percent, escape mostly unscathed, for now. I guess 29% of those 5,000 people don't recall - or want to recall - Bush warning of this fiasco time and time and time and time again. 65 Republicans voted for it, 133 Republicans voted against it as well. The Dems now furiously at Stage 3: Blame The Other Guy. They will not get away with it this time! Once again - and I'm going to repeat this until I am blue in the face; The Dems didn't need one Republican vote to pass the $700 Billion Bailout - not one...not one Republican vote. The Dems HAVE THE MAJORITY and easily had the numbers to sail this bill through. But they didn't. They didn't want to be held accountable or responsible for their actions. This is the link to the YouTube video of Barney Frank, testifying in September , 2003 that, "Fannie Mae and Freddie Mac are not in a crisis." In it, Franks says that the F&F crisis is being "greatly exaggerated." A bit later in the video is fellow co-conspirator of lies Cluck Schumer who praises Freddie and Fannie as doing great jobs. It's a mystery how spBarney and Cluck have the supporters and base that they have. There must be a lot of easy to pull the wool over the eyes voters out East. Barney's just pissed because the mean ol Repubs kept him from dining on a frank. Why he's just flaming mad. Molson, It's unacceptable that Frank maintained F&F is fine and in good shape, and now he's in overdrive panic mode. We need an investigation of Frank, Schumer, Dodd and other involved in the SCANDAL! Which sort of brings up an interesting point Dave, when are they going to call for hearings on this crisis? Gas prices rise in the summer time, every summer since the invention of the internal combustion engine and every summer Cluck Schumer has a hearing. They're using performance enhancing drugs in baseball, and there is a hearing. Hell the Twin towers hadn't even been cleaned up yet and they wanted hearings... So when are the hearings to determine the blame for this debacle going to happen? Could it be that there is no way to afix blame to anyone other than Democrats? (GASP), are you implying that holier-than-thou Dems should be held to the same standard that they hold others?!?!?! You are, as usual, Spot On. That's a nice list of hearings you compiled as well and there's a good blog post in there, outlining month/year that the Dems grandstanded on steriods use in baseball, gas price "gouging", Jack Abramoff, K Street etc etc. When will the hearings and investigations begin on Fannie and Freddie and all the crooks like Frank and Schumer begin? I'm not holding my breath. That's the thing, why aren't the Repubs in front of cameras and microphones (like Schumer) demanding "investigations" into Fannie and Freddie? This is where the Repubs need to get a goshdarned spine. And this is why I consider myself not a Republican, but an Indie-Conservative and small "L" Libertarian (who leans Right on all the right issues). Yeah, the MSM would paint Republicans as being mean and vengeful if they dared to appear before cameras and microphones calling for an investigation of the crooked Dems. No wonder nobody watches the news networks (NBC, CBS, ABC) anymore. All the MSM does is repeat Dem Talking Points. Barney Frank, Nancy Pelosi and Dodd should be removed from office. If they worked for AIG they would be fired or asked to resign.... they work for the american public they should be fired.